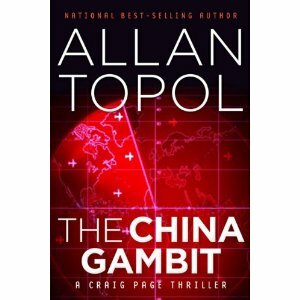 National bestselling author of international intrigue novels, Allan Topol, has just introduced introduced his newest hero, Craig Page, in his first book of his thrilling new international intrigue trilogy, The China Gambit: A Craig Page Thriller (Vantage Point, January 2012). Craig Page--a daring and resourceful former CIA agent, now fighting terrorism in Europe--is determined to find out who killed his daughter, Francesca, a reporter who was on the trail of the biggest story of her young career. Joined by the gutsy Elizabeth Crowder, Francesca's editor, Page peels back the conspiracy layer by layer, ultimately learning that a rogue Chinese General named Zhou has a partner in the scheming CIA director, Kirby, who once forced Craig out of the Agency. Moving from the secretive halls of the CIA to the cold wilds of Canada and beyond, to the bloody streets of Tehran and the exoticism of Beijing, The China Gambit is a fast-paced, relentless, and frighteningly real portrait of our modern world. It's Just The Opening Move. I flew through The China Gambit, I could barely put it down. I love a good mystery/thriller and this was excellent in all arenas. It read incredibly fast and left me wanting more (which I will get in the second of the trilogy, The Spanish Revenge). The characters and plot line were well developed and realistic. It felt so relevant to today's world (yep, even oil is involved--the source of so much international chaos in today's world). This is the first of Allen Topol's books that I have read but I will definitely be reading more of his work. If you enjoy a good mystery/suspense/thriller type book, The China Gambit: A Craig Page Thriller is the perfect book for you! Would you like to win a copy of this book? Giveaway will end at 8 pm cst on Sunday, February 19th. Winner responsible for responding with shipping information. What about this book appeals to you? Have you read any of the other titles by Topol? Thank you to Media Muscle for my sample used in this review and the winners prize, opinions are honest. Review by Michelle. Facebook fan of Springfield Mommy. I've never read any of the books. I signed up for Allan Topol's newsletter. The storyline of this book appeals to me. I haven't read any of the other titles by Topol. I tweeted about this giveaway on Twitter at https://twitter.com/#!/likwan/status/171393572334084096. I shared this giveaway on Facebook at http://www.facebook.com/likwan/posts/145067345613518. I like a good thriller. I haven't read any of the other titles yet. I signed uo for the newsletter. I love that this is a mystery! I have not read any other books by this author.